Here are top 5 best free download PDF Password Remover and Recovery softwares for windows XP/Vista/7/8/10 to decrypt, restore and remove PDF file’s lost or forgotten passwords. This software is a native application, installable on Windows. 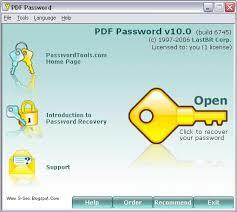 With a user friendly interface, the program assists in cracking the owner password of encrypted PDF files. In a nutshell, PDF Unlocker is a password recovery program working on a brute-force attack method. Key features: The software can recover one file at a time. It works with PDF files up to version 1.7 level 8 and with an encryption of 128-bit AES. It can run on Windows 7, Windows Vista and Windows XP on all 32-bit as well as 64-bit versions. Installation of PDF unlocker requires Java. The PDF Password Remover software has a very basic ‘PDF-in, PDF-out’ working system. This is a password removing program. Unlike PDF Unlocker, it also removes owner passwords from PDF files. But this software fails to work with files which have been encrypted with user passwords. Key features: PDF Password Remover has a simple user interface and is capable of cracking passwords instantly. It efficiently works with PDF files up to version 1.7, level 8, having an encryption of 128-bit RC4. Currently, this software works with equal efficiency on Windows 7, Windows Vista and Windows XP. This is a free pdf password remover online tool, which removes passwords from viewable PDF files. It does away with restrictions on PDF printing and text copying too. It is an efficient tool for removing passwords and the security set of such documents. But, this online tool fails to recover passwords. Key features: The tool works for PDF files that can be opened and read without involving any third party plugins. It cannot unlock files which require passwords to be viewed. It is capable of cracking files of maximum size 250 MB. Tool is perhaps the most efficient PDF password cracking program for Windows system. PDF Crack is capable of recovering owner passwords as well as user passwords. The working principles are the same as that of PDF Unlocker – it uses the brute-force attack method. But, because every good thing comes with a shortcoming, PDF Crack, too, has a drawback. The more complicated the password is, the longer the program will take to crack it. Key features: The program is a command-line tool which works on all versions of Windows. It can effectively crack PDF documents up to version 1.6 with an encryption of 128-bit RC4. The Advanced PDF Password Recovery software has been designed especially for people who often forget passwords of their own PDF files. But, the program is futile if both owner and user passwords are lost. The software is capable of removing restrictions on editing, printing and copying documents instantly. Key features: The program supports all versions of Adobe Acrobat including the very recent Acrobat X. It also supports GPU acceleration, third party plugins and all PDF files of 40-bit and 128-bit RC4 encryption, and 128-bit and 256-bit AES encryption. If you have these 5 tools handy, PDF password removal or recovery will no longer be a headache. You can easily decrypt any password any time with above mentioned Password Remover and Recovery Softwares and does copy, edit or print files without hassles.